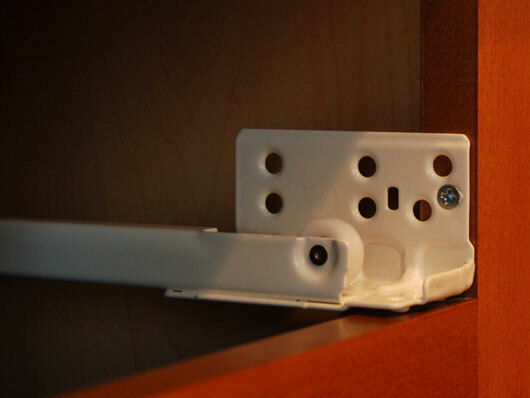 Drawer slides use a track and wheels to help keep the drawer sliding in and out easily. This photo shows a typical white drawer slide which is screwed in to the side of the drawer cubby. The drawer has wheels on the bottom which fit along the track and keep the movement of the drawer smooth. Drawer slides allow drawers to be opened and shut. They range from light- to heavy-duty, and can be side-mounted, under-mounted in pairs, or center-mounted. Lighter-duty drawers may be made with nylon rollers, while heavier-duty drawer slides may be made with industrial ball bearings. Light-duty slides are rated for up to 75 pounds, medium-duty slides are rated to 120 pounds, and heavy-duty slides are rated for over 120 pounds. When choosing drawer slides, it's important to take into consideration the use of the drawer. Drawers that are going to be filled with heavy objects, for example, require slides rated for more weight. When the slides and drawer design complement each other, the drawer will operate more smoothly and it will last significantly longer. As a general rule of thumb, slides that run on ball bearings work more smoothly and last longer than those that operate using friction. Most drawer slides can be installed by the do-it-yourselfer. Drawers should be built so that they are an inch smaller than the opening, allowing for a 1/2" on either side. That will ensure that the drawer is snug enough to slide without wiggling or derailing, but not so snug that the drawer is difficult to open. Drawer slides come in all sizes and for just about every application, from those that complement small drawers designed to hold jewelry, to those that complement drawers expected to hold hundreds of pounds of tools and machinery.